Call me a hater, but I actually don’t think the clam broth ramen from Konjiki Hototogisu is that great. Don’t get me wrong, I think they are well deserved for their Michelin Star, but a lot of factors go in to the Michelin Star that will sometimes overlook the ramen in general. The criteria remains a secret kept within the confines of the book’s staff, but one can assume that in addition to the ramen dishes themselves, things like consistency, shop decor, and atmosphere all play pivotal roles in determining which shops are awarded one and those who don’t even get a Bib Gourmand mention. As someone who judges restaurants purely based on the ramen itself, with shop decor and atmosphere playing a fairly small part in criteria, I think Mugi to Olive is the best shellfish broth ramen you can get here in Tokyo. Located in the ritzy Ginza district of Tokyo, they don’t skimp on their shop decor either. It’s a shame they don’t get the recognition they deserve, but hopefully this review will help you see the other ramen bowls available to you here in Japan. Mugi to Olive is located just a short, equidistant walk from either the Ginza or Higashi Ginza stations of the Tokyo Metro line. Opening hours are 11:30 to 22:00 Sunday to Friday and 11:30-21:00 on Saturdays and national holidays. There are times when they close after lunch service if they run out of soup, but they will typically replenish and reopen by 17:30 so be careful if you end up going any time between 14:30-17:30 as you risk the chance of coming during an unfortunate dinner preparation period. The menu here is quite simple. They have English menu available, but if its busy and you can’t be bothered to wave down a shop staff, here are the translations of the ticket machine. The top two blue buttons are the beers (both same buttons) and the green button on the right is their Osusume, or recommended item, which is never available for whatever reason (hence the red cross). The next row down starting from the left is the Tori Soba (Chicken broth ramen), Tokusei Tori Soba (Chicken broth ramen with extra toppings), Hamaguri Soba (Clam broth ramen), and Tokusei Hamaguri Soba (Clam broth ramen with extra toppings). Next row down is the Triple Soba (Clam, Chicken and Niboshi soup mixed in to one), the Tokusei Triple Soba (aforementioned trip soup with extra toppings), Noukou Tamago no Maze Soba (Condensed no soup ramen with egg), and the Tokusei Noukou Tamago no Maze Soba (Condensed no soup ramen with egg and extra toppings). The row below is to make your ramen with extra noodles (all four are the same buttons) and the row below that are the tsukemen options of Tori to Hamaguri no Noukou Tsukemen (Chicken and Clam, condensed tsukemen) and the Tokusei version on the right. The two with the cross are buttons for the Tokumori, or extra large serving noodles, but they eliminated the option from my two visits so you’ll have to settle for the regular order. Even with the regular order you can choose between medium portion and large portion of noodles at no extra charge so if you’re feeling hungry, go for the large portion. Finally at the very bottom are the Tamagokake Gohan (Raw egg over rice), Rice, Chicken Dried Curry Rice, and a topping for extra marinated soft boiled egg. The far right button is the extra char siu topping which is only rarely available (hence the red cross). I opted for the Tokusei Hamaguri Soba, the clam broth ramen with extra toppings, while my friend ordered the Tokusei Tori Soba, the chicken broth with extra toppings. Like I mentioned before, the clam broth ramen here is phenomenal and I think is best in Tokyo. My friend mentioned that this is starkly different than Konjiki Hototogisu in that Mugi to Olive really pride themselves in bringing a clam broth with tons of shellfish flavor, while Konjiki Hototogisu tones it down a bit drawing the umami of the shellfish without some of the distinct clam flavors. I guess, given his observation, one could say, as with most ramen in general, your personal preference will dictate which you find more pleasing to your palette. I for one would much rather have this distinct, clam punch in my mouth with every spoonful rather than having subtle notes like the one at Konjiki Hototogisu. The flavor here is really like eating some freshly opened raw clams. You get the initial salty, ocean brine followed by the sweetness of the meat shining through at the end. The addition of the steamed clams adds to that flavor, compounding those complex flavors as you have the toppings mid bowl. The light shoyu used helps bring out the flavor of the ocean without muddling the broth too much and I relate it to the sensation you get with sashimi or sushi dipped in shoyu. Having the combination of sweet, salty, brininess of the clam with the savoriness of the soy sauce made from an amazing depth of flavors with each bite. The noodles were probably the only downfall to the bowl in general. Not that there’s anything wrong with it, and it pairs fine with the soup, but Mugi is the Japanese word for barley. I expected a bit stronger notes of barley and wheat in the noodles, but this is likely just my expectation influencing my palette a bit. The toppings here were on point, the chicken char siu were sous vide and maintains their moisture throughout the meal. They use chicken breast which is, in the words of Matty Matheson, the worst cut of the chicken, but given the delicate flavor of the broth, I would assume a fattier cut would have interfered too much with the bowl. The pork char siu which comes with the Tokusei bowl was cooked a bit rare with pinkness throughout, but this style leaves a lot of texture to the meat and gave a nice contrast to the other components. Was it necessary? Probably not, but I can’t help myself from ordering Tokusei when available. Finally the bowl is rounded out with the large, dried seaweed adding even more to the already seafood heavy flavors, and a fish cake tied in a knot to really highlight this dish as originating from the ocean. Finally, I forgot to take a proper photo, but they have infused olive oil in the steel canister on the table, hence the olive part of their restaurant name. Honestly, this was fantastic in the clam ramen because clam, naturally, lack oils and fats that would usually be the norm in a chicken or pork broth. The olive oil solves that problem and adds a bit of a European vibe giving it some strength and a bit of creaminess to the soup. Regulars of Mugi to Olive actually put this in from the start, but I opted to add it midway as a way to give it a little flavor change within my meal. Nevertheless, add it at some point in your meal to give it a bit of fatty goodness. And it wouldn’t be a ramenguidejapan review without ordering a restaurant’s rice bowl and this time I was pleasantly surprised with a dry curry rice bowl. 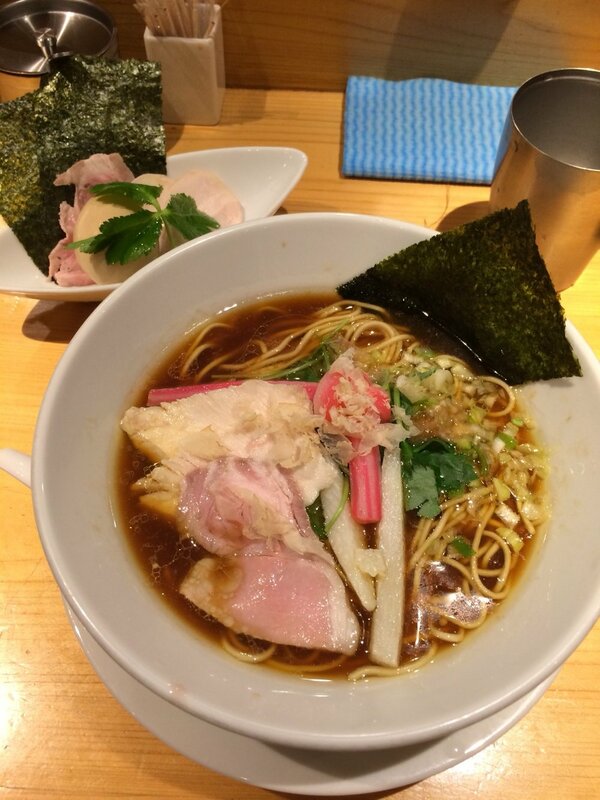 As you may know from previous reviews, curry at ramen shops are 9 times out of 10…phenomenal. What usually happens is that ramen shops will use their ramen broth without the tare seasoning as the broth for their curry. However, since this is a dry curry, those flavors are even more enhanced as it is an uber condensed version of the broth as it was likely simmered down until no liquid remains. It was quite good and more Indian flavored than Japanese flavored. The ketchup was interesting, giving it the acidic notes to cut through the richness of the curry. I quite enjoyed this and would definitely recommend on your visit if you’re hungry enough. Next I had a bite of my friend’s Tori Soba. The broth here is chicken and is a chintan, tanrei soup similar to the clam ramen. It didn’t have quite the umami bomb as the clam, but makes up for it with an amazing fried green onion aroma which gives it the extra little oil and flavor notes it needs to bump it from a mediocre chicken ramen to a great one. I imagine they didn’t completely abandon seafood from their broth and I had some subtle hints of Niboshi when I tasted the soup. The topping difference here is a slice of pork char siu rather than the clams and a thin sliver of mountain yams. It still comes with the fish cake, albeit in another color giving a nice variety of herbs, seafood, vegetables and protein to the bowl. So when you read a review and see a clam broth ramen, know that there is a range in how strong that broth is. It might seem obvious, but honestly when I first went to Konjiki Hototogisu, I imagined the broth to be way more pronounced in their seafood flavor than what I was served. If you’re looking for a true, deep clam broth, make your way to Mugi to Olive. Hands down, the only place I know that embraces this seafood flavor profile and let it smack you in the face with it. Have a visit to both and compare yourself as it’ll be a great way to experience first hand how each chef’s interpretation of the same concept can vastly change a broth. As always, if you do, be sure to leave me a comment on my facebook, instagram, twitter or the section below on what you thought!